If World War II established the role of airlift in the American military, the Korean Conflict confirmed it. Perhaps in no other war in American history has fixed-wing airlift played so major a role. Airlifters in Korea maintained an airbridge between combat units in the field in Korea and rear area bases in Japan. Rugged terrain and poorly maintained roads led to airdrop becoming the principal method of supplying troops in the field while air evacuation of patients from field hospitals saved thousands of lives. Airlift began the American role in the Korean War. Prior to the crossing of the 38th Parallel by North Korean troops in June, 1950 there were few American military personnel in South Korea. At the same time, the United States Army in Japan was ill-equipped for combat while airlift resources in the Far East consisted solely of the 374th Troop Carrier Wing, which operated two squadrons of C-54s out of Tachikawa in Japan and another out of Clark Field, Philippines. The day the war broke out, General Douglas MacArthur ordered the 374th to dispatch C-54s to Korean bases to evacuate American civilians and the few American military advisors who were in the now-embattled country. Initially, the four-engine C-54s operated into Seoul's Kimpo Airport, but operations were moved to Suwon when the Korean capital fell. A C-54 was lost on the ground at Suwon a few days after the war started when it was strafed by North Korean fighters. USAF fighters from bases in Japan escorted the C-54s into Korean airspace. In response to the emerging conflict, Far East Air Forces ordered every available C-47 in the region to Japan, while experienced multi-engine pilots were pulled out of desk jobs and sent to Tachikawa to join the 21st Troop Carrier Squadron; the squadron's C-54s were distributed among the wing's other two squadrons, the 6th and 22nd TCS. The 21st transferred immediately to Ashiya air base on Kyushu, which was the closest American base to the Korean peninsula. Additional airplanes and flight crews were rushed to Japan from the United States. The C-47s joined the airlift as South Korean forces retreated southward until there were only three usable airstrips on the Peninsula, all located in the vicinity of Pusan. The first American combat troops to go to Korea were elements of the 24th Infantry Division, who were airlifted from Itazuke to Korea. Though the airlift began with C-54s, most of the troops were transported aboard C-47s because of damage to the runways at Pusan, Taegu and Pohang by the heavier transports. To spare the airfields, troops were airlifted from Itazuke to Ashiya aboard C-54s, then transferred to the smaller C-47s for the flight across the Sea of Japan to the Pusan Peninsula. 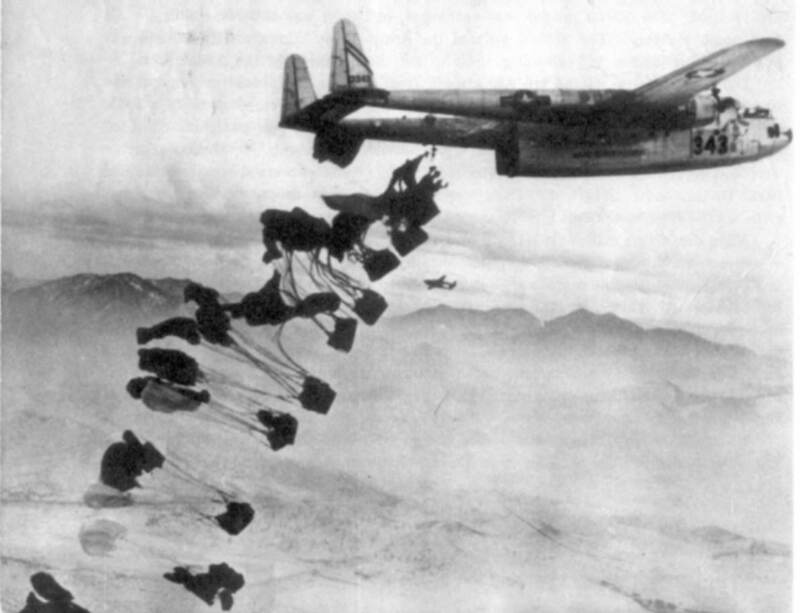 Airdrops by C-47s began as soon as the US troops arrived, with US Army personnel from the 2348th Quartermaster Company doing the rigging and flying as kickers on the drop missions. Air evacuation of casaulties also began early, as flight nurses from the 801st Medical Air Evacuation Squadron joined some of the transport crews. Some air evacuation took place without the benefit of medical personnel. A few C-46s assigned to the 1st Provisional Group also joined the airlift; eventually there would be a full C-46 wing in Japan. In late August, 1950 Major General William H. Tunner, who had commanded the Berlin Airlift the year before and who had been the last commander of the Air Transport Command effort in the CBI, arrived in Japan on temporary duty from his position as Deputy Commander of Military Air Transport Service. Tunner's mission was to organize a more effective airlift apparatus and to implement procedures to insure a constant flow of transports into Korea. This was Tunner's first (and only) experience with an airlift under combat conditions. Tunner brought with him a staff made up of men with previous airlift experience. While enroute to Japan they drew up plans for what became the Combat Cargo Command (Provisional), operating directly under the control of Far East Air Forces. Tunner's first action was to implement operating methods that had worked during the Berlin Airlift. A Transport Movement Control center was established at Ashiya, and all transport movements were coordinated through it. 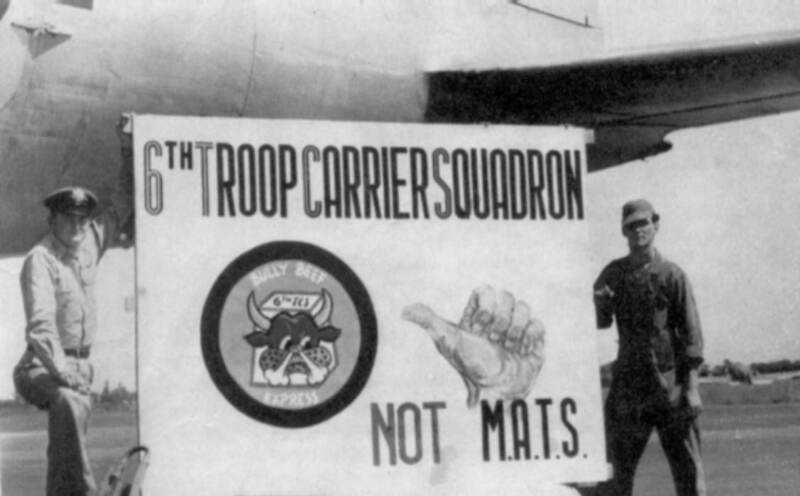 Tunner's association with MATS caused the press to attribute the Combat Cargo Command's actions to MATS, which caused considerable resentment among CCC personnel. Tunner's arrival in Japan coincided with the arrival of the 314th Troop Carrier Group, which was dispatched from its home base with the 314th Wing at Sewart AFB, Tennessee primarily to support the Army's 187th Regimental Combat Team, an airborne unit that was on its way to Japan aboard ships. The 314th TCG C-119s joined the C-54s in the airlift of supplies to Korea as the C-47s turned more toward airdrop. Unlike the other transports, the C-119 had been designed with military capabilities and was able to move items of cargo, particularly rolling stock, that could not be carried in C-54s, C-47s and C-46s. General Tunner implemented specific air routes from Japan to Korea, and pilots were instructed to fly at specific altitudes in a general tightening up of the airlift structure. As more and more United Nations troop arrived in Korea, the UN position became more teneable. General MacArthur began making plans for an amphibious landing at Inchon Harbor just off of Seoul. Though the plan was very risky, it was approved by the US Navy and the invasion was launched. Originally, an airdrop by the 187th RCT had been planned, but since the unit was still aboard ship the invasion went on without them. Marines from the 1st Division seized Kimpo Airfield, and Combat Cargo Command transports began arriving with reinforcements and supplies. When the tardy paratroopers arrived in Japan, they were loaded immediately onto CCC transports and airlifted to Kimpo, where they joined the ground fighting. The 187th was soon pulled out of combat and back to Kimpo, where they began training for either an airdrop or airland attack in the near future. As the fighting moved northward, CCC transports moved their operations north along with it, as the C-47s, C-54s and C-46s landed with supplies on a grass strip at Sinmak. Intelligence sources learned that the North Korean were holding a large number of American prisoners in Pyongyang, and were preparing to move them north. Plans for an airdrop between Sukchon and Sunchon were made, with the dual purpose of intercepting the POW train and seizing key North Korean communications centers. On October 20 the 187th jumped in the Sukchon-Sunchon area from 75 C-119s and 40 C-47s. The drop was observed by General Tunner, who was flying nearby in a C-54 command ship, borrowing a technique pioneered by General George Kenney in WW II. General Douglas MacArthur also observed the drop from his personal C-54, "Bataan." More than 3,000 troops jumped. Behind them came more C-119s dropping heavy equipment - jeeps, trucks, artillery and pallets of supplies. Unfortunately, the planned drop was delayed by weather and the paratroopers failed to intercept the train. When it was finally found, the bodies of 57 Americans were found nearby. After the Sukchon-Sunchon drops, the UN forces in Korea were on a roll. Soon Pyongang itself fell, and it was not long before they were almost at the Yalu River. Combat Cargo Command transports delivered supplies as close to the front as possible, and evacuated wounded on the return flights. By this time a wing of C-46s, the 437th Troop Carrier Wing, a reserve unit from Chicago, had arrived in Japan and had joined the airlift. In mid-October Chinese troops crossed the Yalu River and entered the Korean War. Two weeks later, on November 1, Russian-built (and flown) MiG fighters made their first appearance in what had become an entirely new war. The UN advance suddenly turned into a retreat. Terrible winter weather which made an early appearance complicated matters. A combined force made up of the 1st Marine Division and the US Army 7th Infantry Division attacked Communist troops to relieve the pressured Eighth Army, which had been advancing up the center of North Korea. But the Marines and 7th Infantry found themselves facing a far superior force. The Americans began retreating southward in the vicinity of the Chosen Reservoir. During the retreat they were supplied by airdrops from 314th TCG C-119s while C-47s from the 21st TCS landed on hastily prepared landing strips, first at Hagaru-ri, then as the retreat continued at an even more primitive strip at Koto-ri. After dropping off supplies, the C-47s of the Kyushu Gypsies, as the men of the 21st began calling themselves, evacuated casualties who would otherwise likely have been left to die in the snow. The C-47 crews used every ounce of airmanship and skill at their disposal to manuever through the mountain ridges around the reservoir to the airstrips, as did the C-119 drop planes. After the Marines left Koto-ri, they encountered what appeared to be an insurmontable roadblock when they came to a deep gorge where the Chinese had blown up a 20-foot span of bridge. There was no other way around the gorge, and it appeared the retreating troops were going to have to abandon their vehicles and continue the retreat on foot. By this time the Marines were convinced the Combat Cargo Command transports could do anything, so they radioed a request for a drop of a Bailey Treadway Bridge, an item that had never been dropped before. Aerial delivery personnel at Ashiya decided the bridge could be dropped in eight 4,000-pound sections, using two parachutes on each section. One section was dropped at Yonpo in a test drop, and when it reached the ground okay, the eight sections were loaded onboard C-119s. The next day eight C-119s dropped the bridge, and soon the Marines and soldiers were once again on their way south. Throughout the retreat, CCC transports evacuated personnel and supplies from bases along the route. As the UN forces retreated, they were kept supplied the same way they had been during their advance - by airdrop. USAF personnel assigned to the Combat Cargo Support Unit were often the last to leave an airfield as it was abandoned. UN forces continued retreating southward until Seoul was once again threatened. At Kimpo an emergency airlift was organized to move 1,000 orphans south to Chejedo. Twelve C-54s from the recently arrived 61st Troop Carrier Group made the move. Eventually the retreating forces halted as they again reached the Pusan Perimeter. In late January, 1951 the Combat Cargo Command became the 315th Air Division (Combat Cargo.) A few days later General Tunner and his staff, who had come to the Far East only on temporary duty, were replaced by permanently assigned personnel. BGen. John P. Henebry, the commander of the 437th TCW, a reserve unit equipped with C-46s that had transferred to Japan from Chicago, moved up to command the new airlift division. During the interval after the retreat, the CCC transports had been flying more and more supplies and reinforcements into Korea, while others arrived by ship. Gasoline was a major commodity delivered by the transports, both by landing and by airdrop. With the new reinforcements and supplies, the Eighth Army once again began advancing northward. During the retreat and subsequent holding action, the men of the 187th RCT team were fighting in the lines, but in late February the unit was pulled out of action and sent to Taegu, where they went into training for another airdrop operation. On March 22, 1951 the troopers jumped from eighty C-119s and 55 C-46s that replaced C-47s on the drop as the Skytrains were in short supply. Overall, the drop went well, though one serial of C-46s dropped their troops in the wrong place. One C-119 was lost when it blew-up in midair after taking a number of hits from the ground fire. The cargo kickers and some of the crew bailed out before the explosion, which claimed the lives of the two pilots. After the Munsan-ni drops, the Korean War entered the stalemate which would continue for more than a year. Still, the fighting continued and the role of the 315th AD transports was as important as ever. While the larger C-54s and C-119s continued to deliver supplies to Korea from Japan, the C-46s and C-47s contined to land at forward airfields and to deliver supplies and evacuate wounded to rear areas, where they were loaded onto C-54s for the flight to Japan. 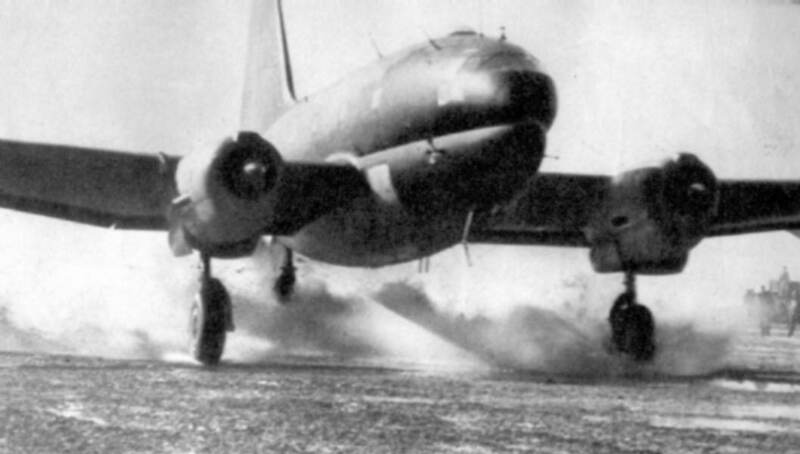 Airdrop continued to be an important airlift mission, as C-46s, C-47s and C-119s flew daily missions dropping ammunition and other supplies where they were most needed. 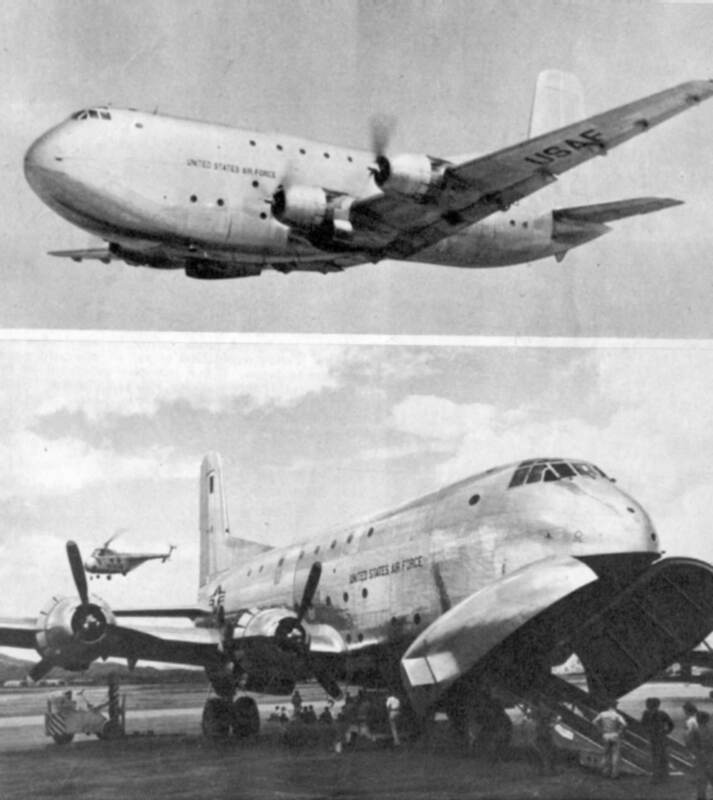 In the fall of 1951 the giant C-124 "Globemaster II" made its appearance in the war, as a single airplane was sent to Japan for testing under combat conditions. 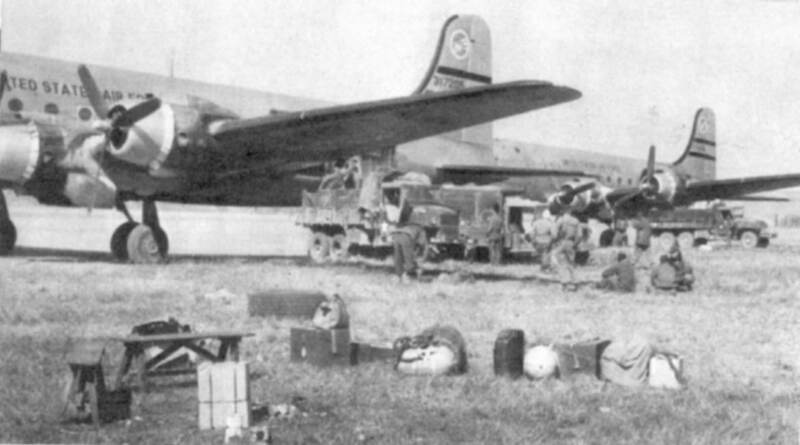 After the test, the 374th Troop Carrier Wing began converting from C-54s to the new transport. Psychological warfare was also a 315th Air Division mission, along with special operations. The psy-ops missions were flown by the Kyushu Gypsie C-47s. As the war continued, a special flight was set up within the 21st TCS to operate modified C-47s equipped with loudspeakers and leafling dropping equipment. Operation "Beach Comber" involved landing loaded C-47s on beaches on islands off the coast of North Korea from which US and ROK personnel kept watch on North Korean positions. The Gypsy C-47s landed on the islands with the longer beaches, and made low-level drops to the men on those without suitable landing places. The C-47 crews made their drops while on their way to land on the larger islands. Drops were also made to a USAF tactical air control radio station that was installed on top of a mountain near the 38th Parallel. The "Aching Back" missions were flown by C-119s of the 314th Troop Carrier Group. Logisitical missions in support of Fifth Air Force and other military units were a major mission for the 315th Air Division transports. Scheduled flights operated in and out of the Korean airfields from Japan, bringing in supplies and newly assigned personnel and returning rotating troops on the return flights. Special missions operated to transport troops to and from Japan for R&R. The role of the Military Air Transport Service remained logistical throughout the war. MATS transports, supplemented by Tactical Air Command C-54 and C-124 squadrons and civil contract carriers, operated between the US West Coast and Japan. The most seriously wounded casualties from Korea were returned to the US on MATS flights. On July 27, 1953 the Korean War came to a close in an uneasy truce. One of the lessons that had been learned during the war was that airlift could play an important role in conflicts of that nature, especially in a land where the terrain was as inhospitable as in Korea. The 315th Air Division commanders reported that the war illustrated the need for a new transport capable of performing all of the missions that had fallen to a variety of types during the conflict. Such an airplane was already under development in the United States. Based on lessons learned in the Korean Conflict, Lockheed Aircraft Corporation's new YC-130 "Hercules" would revolutionize military airlift.